The various greens, which had an early start this year have also started coming in along with the beets, so I finally got a chance to try this recipe, akin to the Bicol Express which is taro leaves simmered in coconut milk and spiced with peppers. Since I don’t have taro leaves available here, I remembered TingAling’s suggestion sometime ago that the recipe would work well with collard greens too. I haven’t had a chance to try it out until now. In addition to collard greens, I also tossed in the greens from the early harvest of beets; that’s the reddish greens you see in the photo. Heat about a tablespoon of oil and saute’ the pork until it becomes opaque and edges turn slighly brown. Add the garlic and fry for about one minute until it becomes fragrant, then add the onions and sautee another minute. Add the coconut milk and let it come to a simmer. Season with salt and pepper to your taste. Add the chopped greens and chili peppers. Stir briefly and cover. Let it simmer until the greens are tender and most of the liquid has evaporated. Adjust seasonings and serve. This sounds wonderful! My Tatay is from Nabua, Camarines Sur and would love this recipe. 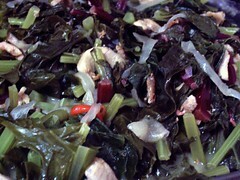 We eat collard greens often (he was a cook in the Navy) and never thought of cooking it the Bicolano way. Thank you for sharing.